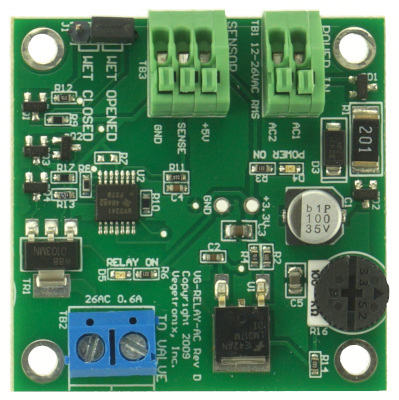 The VG-RELAY-AC board is perfect for controlling traditional sprinkler valves or other AC loads such as low power pumps. It interfaces directly to Vegetronix soil moisture sensors. It can be wired in series to valves and block watering events from a valve clock. In addition, since it is AC powered it can directly draw it's power from the clock. It has 2 LEDs to indicate that the board has power, and the on/off state of the relay. It is not recommended for DC or high power loads. The VG-RELAY-AC board interfaces to a single VH400 soil sensor, and can activate a low power AC load such as a valve or alarm, or other control device, when a moisture level is reached. The threshold is easily set with the onboard variable resistor, and a small screwdriver. The relay board can be configured with a jumper to turn the relay on when the sensor detects wetness or on when the sensor detects dryness. The VG-RELAY-AC also serves as an evaluation board. If you are thinking about testing our VH400 soil moisture sensors you should consider purchasing this board as well. Wiring up this relay board to a valve and irrigation clock is very simple, as seen in the connection diagram below. The board is wired to a common and a valve output of the irrigation clock, and in turn it directly drives a single valve. Take care in not allowing the valve driver outputs to short together, in this will cause irreparable damage to the relay board. If your irrigation system drives a water pump, you should consider our Sprinkler Pump Blocker. This device will automatically turn off your pump when no valves are energized. Showing interface to Valve and VH400 Soil Moisture Probe. Perfect for evaluating our VH400 soil moisture probes. Interruption and control off irrigation and	sprinkler systems. Interface soil moisture sensors to home	automation systems. Control and monitoring of moisture content in bulk foods. Rain and weather control functions. Fluid level measurements and control. Wide AC input voltage range. Can be configured as a normally open or normally closed contact with a simple jumper setting. Uses a low power solid state relay. Can control an AC 0.6A load up to 600VAC. Interfaces to a single VH400 probe. LED indicators, indicate power on and relay	contact. Terminal blocks for quick connection. 4 mounting holes in each corner. Power consumption < 40mA when relay engaged. Supply Voltage 6V to 26 VAC (rms). The best way to get started is to purchase a few low cost probes and relay boards and try them out in your application.